This winter, let’s head south to the Spanish region of Extremadura where we will be able to explore the areas of Tentudia and Sierra Suroeste. These landscapes will transport us to the times of Knights Templar, Arab legends and endless battles . This land is marked by hills and meadows of oaks, the silent witnesses during centuries of military conflicts between Muslims and Christians. This is the reason why we can still run into citadels and fortresses today that help us imagine the kind of life the inhabitants of this region lived for centuries . This is a route to feel like a real medieval knight! We start our journey in Zafra, the gateway to the Southern Badajoz mountains. The city is organized around two squares (the Plaza Chica and the Plaza Grande) and it has a medieval urban layout . This town has Roman origins , but also lived to see the Caliphate of Córdoba. After that, it was under the Taifa’s command and, a bit later, it was incorporated into the Kingdom of Castile. Such exciting history is evident in its diverse architecture styles. 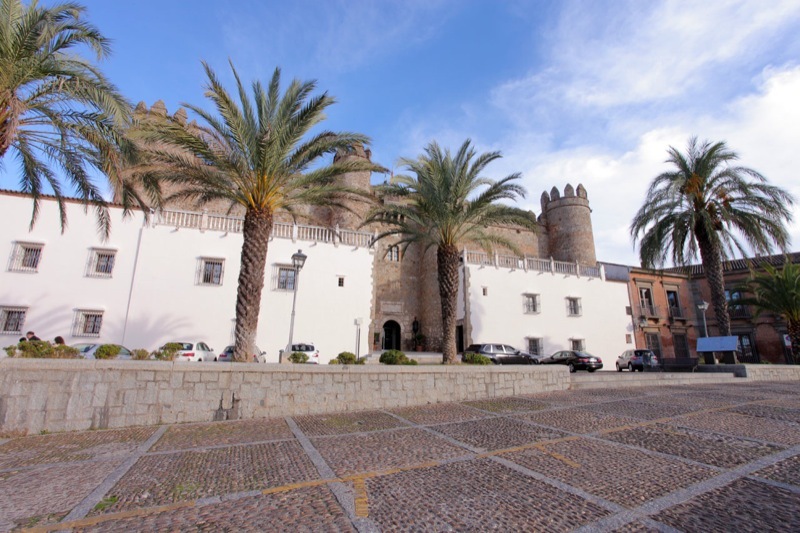 It still has three gates in the medieval walls, as well and the Gothic-Renaissance palace of the Dukes of Feria, (fifteenth and sixteenth centuries). This noble structure was erected in order to protect the city and nowadays is a luxurious National Tourism Parador hotel. 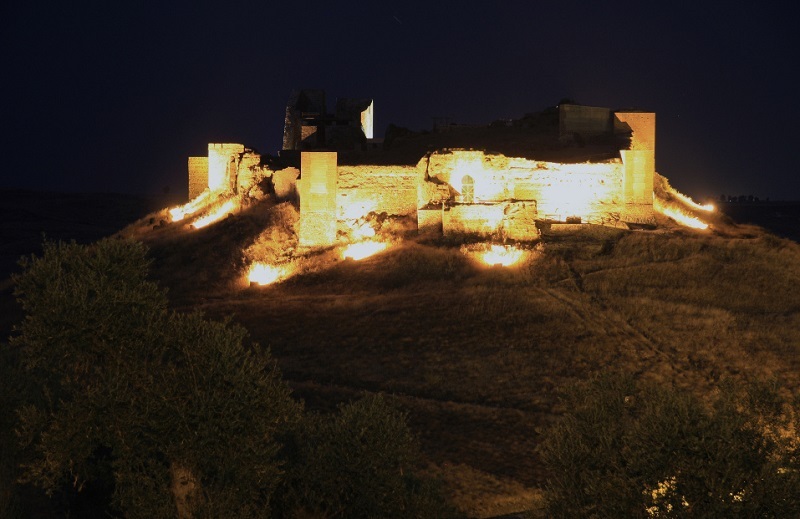 Alongside the A-66 highway, you will see the last Extremaduran stronghold that was taken away from the Arabs during the Reconquista time: The castle of Montemolin is on top of a hill close to Sierra Morena. 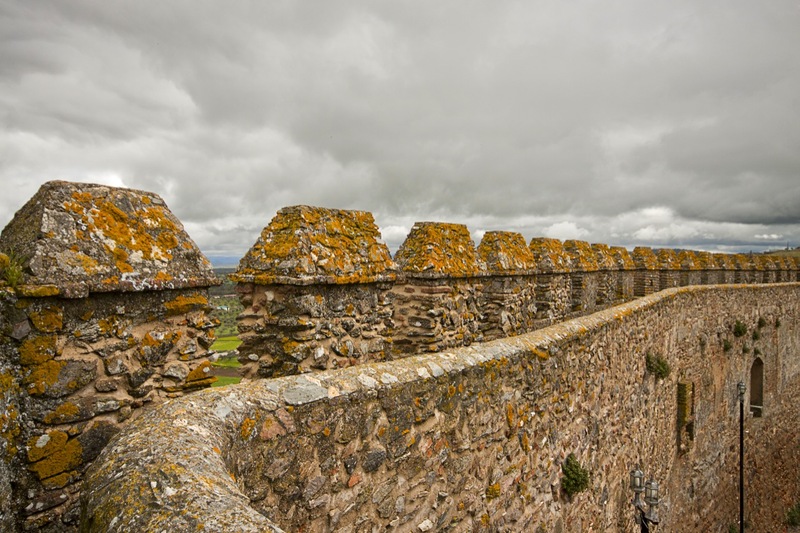 This is a clear example of the Almohad strategy: they used to create a line of castles throughout the province to prevent the advance of the Christian troops. Thus, the arrangement of the towers, the thickness of the walls, and the general construction style correspond to this time. However, the Tower of Homage is part of another chapter in the history of this castle. 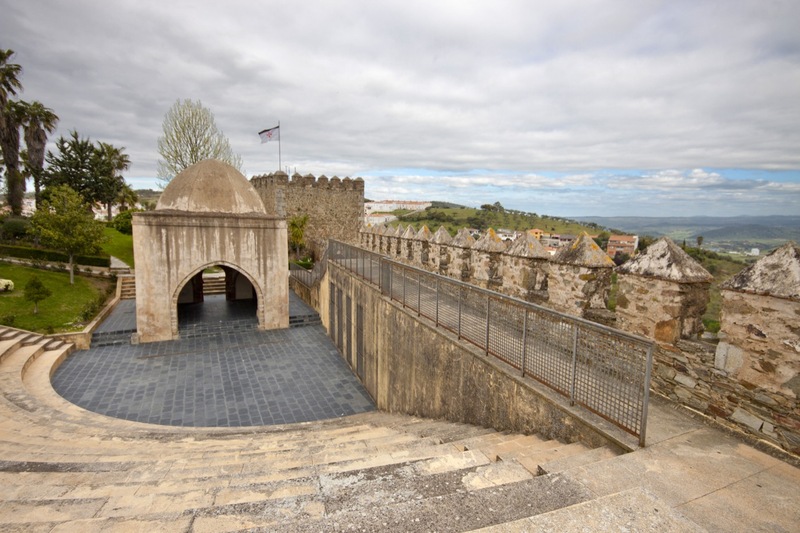 From mid-twelfth century on, the Order of Santiago occupied the structure and built a new castle on the remains of the Moorish fortress. Nowadays, all the remains are in ruins, but you can still see how they adapted the huge grounds of the fortress to the rugged landscape, a sign of the strategic importance of Montemolin. Besides, it holds the remains of a church dedicated to Saint Dominic inside. After wandering around the ruins of the fortress , you can make a stop at Cabeza la Vaca to admire its mountain architecture and ancient bullfighting ring built in the eighteenth century. Continue to Segura de León, a town that is known for its robust castle with an irregular plant that adapts to the area’s irregular relief. This Spanish castle built by the Order of Santiago between the twelfth and sixteenth centuries is surrounded by legends. Despite its obvious decline, you can still see some parts of its ancient walls and the remains of the moat that protected the main entrance. You can also go inside to discover a vaulted chapel, a dungeon, and several rooms with striking names such as Garcilaso’s Room. But undoubtedly, the most important element in this structure is the Tower of Homage. Ask a local to tell you the fascinating story of the maid that used to live in it. 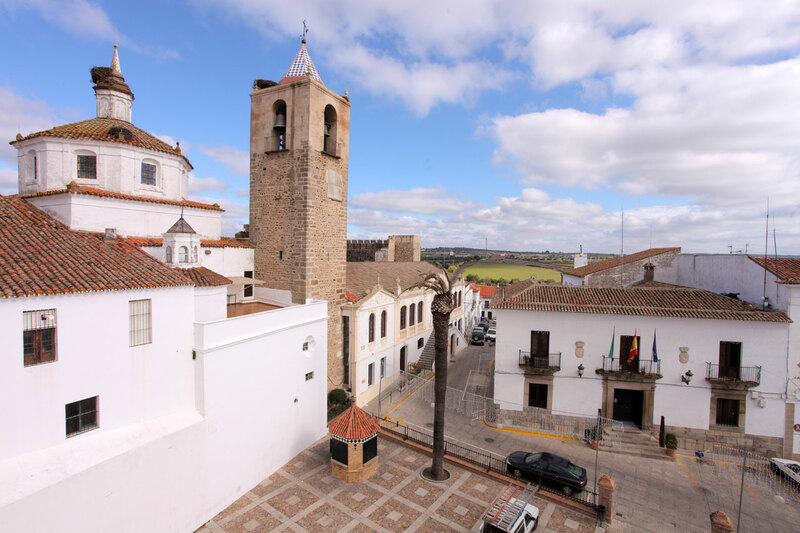 The next stop is one of the most famous towns in our Badajoz route: Fregenal de la Sierra was a melting pot of peoples and cultures because of its privileged location on the edge of Sierra Morena, bordering the north of Huelva and the Portuguese region of Alentejo. It features treasures such as the Nertobriga Roman site, dating from the first century BC. A visit to this town is not complete unless you see the Templar castle. Although it has Arab origins, it was donated to the knights Templar in the thirteenth century. The fort retains seven towers. Among them, as usual in this type of buildings, the Tower of Homage is the most special one. It houses a bullfighting arena, which was originally a parade ground, and a food market. The church of Santa Maria, which is considered the largest church in the village, is connected to the castle through one of the towers. Later, in the eighteenth century, the courtyard was converted into a bullring. Frenegal is also a good choice to taste the region’s typical pork products and serrano ham from the Iberian pigs that live on these meadows and mountains. Don’t leave the town without trying its typical dishes, such as bacalao engazpachao, mandanga de revoltillos, caldereta or roasted leg of lamb. This is the ultimate Templar town: Jerez de los Caballeros, located in a pretty spot between oaks and rivers, boasts beautiful palaces and churches that are mixed with the Templar legacy. Back in the day, this was the capital of the Knights Templar’s Bayliato of Xerez. The castle is still in pretty good shape and it takes us to a regal era when this robust fortress was able to repel numerous attacks thanks to its masonry and pentagonal plant. Even now you can still see four of the six gates that this stone wall had, which have been able to stand the test of time and sieges throughout its history. But besides the castle, the narrow streets of Jerez de los Caballeros hide numerous religious monuments, palaces, and typical houses. To complete your journey, you can even visit a prehistoric site, the Dolmen of Toriñuelo. And for nature lovers, the swamps of Brovales and Valuengo are not to be missed in the surroundings of this Templar town. This winter, let’s head south to the Spanish region Extremadura, where the landscapes will transport you to the times of Knights Templar & endless battles.